Yup, with Microsoft’s deep pockets (and almost 20 BILLION in cash) Microsoft is willing (and able) to offer Cashback on a huge number of product purchases made on the internet, as long as you begin your “Searching” for the item on Live.com. Pretty groovy eh! 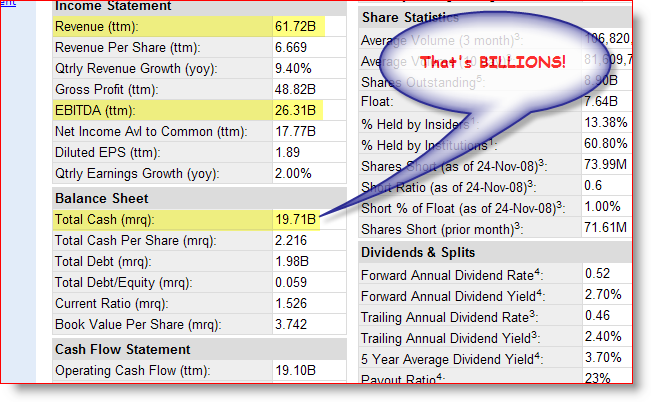 Personally, I like the idea of Cashback from Uncle Bill for a few reasons. First, with a name like Microsoft you know it’s not a fly-by-night scheme. Follow the rules, and you can be pretty sure a check is on the way. Second, I’m already going to buy something so why not get some cash-back into my pocket? Third, no need to mess around with Rebate checks! I’m soooo sick of cutting out UPC codes, pre-registering on websites and HOPING that I get my rebate back in the 14-36 Weeks quoted (and hopefully the check doesn’t get mixed up with Junk mail and thrown out.) And lastly, why not? FREE MONEY is very GROOVY! Now there are a few “rules” about using Cashback, just like those annoying rebate offers. But, as long as you don’t try to abuse the service you shouldn’t have any problems. Here are a few quick rules about Live Cashback. You may earn only up to Two Thousand Five Hundred U.S. Dollars ($2,500.00) of Cashback rewards in a calendar year. You will not earn cashback rewards on purchases where (a) you open the store’s web site in a different web browser; (b) your browser is not configured to accept cookies; (c) the purchase is not completed in the same web browsing session (not to exceed 24 hours) initiated by clicking on the eligible advertisement or listing; (d) the order is later cancelled or the goods or services are later returned; (e) the store does not report the purchase to Microsoft; (f) the goods or services are acquired for resale or other business purposes; (g) you also use a separate discount or coupon; or (h) you exceed the annual monetary cap on cashback rewards. Live Search cashback rewards are not available on purchases of gift cards or gift certificates or on purchases you make from yourself or entities that you control or in collusion with other people. You may only earn up to Two Hundred U.S. Dollars ($200.00) of Cashback rewards per individual purchase order. To give you a taste of how EASY it is, here’s a quick & groovy How-To for earning Cashback using Microsoft Live. 1. Open your Internet Browser and goto http://www.live.com/ (or just click here) After the site loads, Click Sign in. 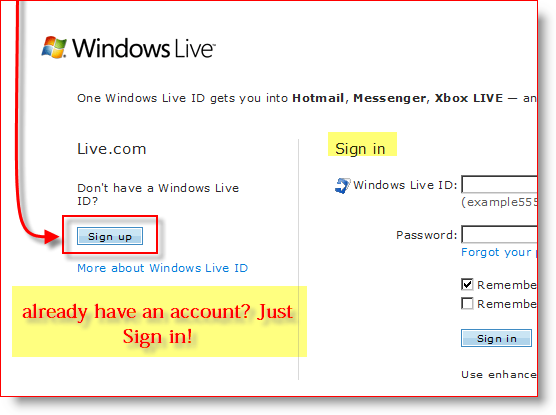 Next, you’ll need to Create or Login your Live Account. 2. Click Sign up, or if you already have an account just Sign in. To keep things simple, I’m not going to walk you through the full account setup. BUT, once your Windows Live account is up and running and you’re logged in, continue to Step #3. 3. 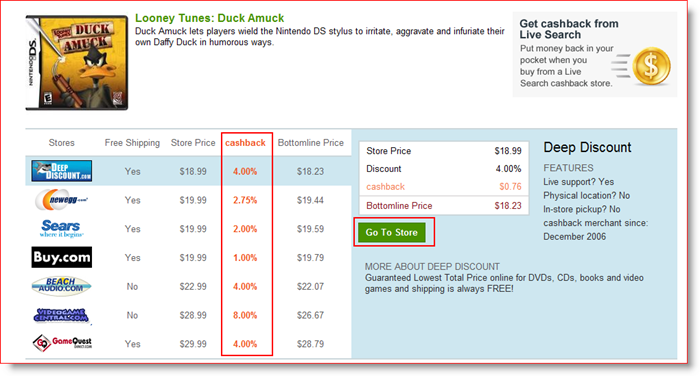 While you’re logged in, from the main Live.com page, just Click the Cashback tab. Then Click Your Cashback Account. 4. Set up your Reward methods here. This setup determines how you get paid! It’s a good idea to set this up ahead of time, so you won’t need to mess with it again while you’re shopping, especially with the Instant Cashback live.com offers. Options are pretty self-explanatory. I prefer the PayPal option. 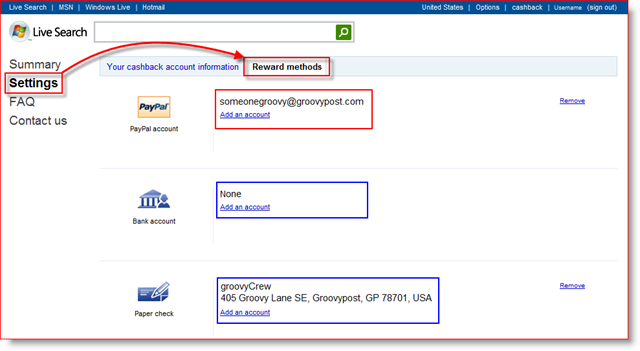 However, Live.com Cashback Reward methods also support Direct Deposit to your Bank account or Snail Mail via Paper Check. 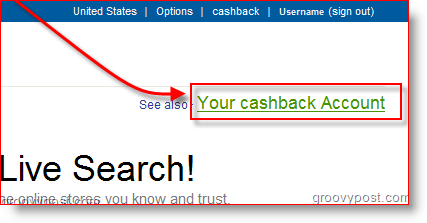 Note: PayPal Payment Method is the only Instant Cashback Reward Method. Just one more reason to stick with it. 5. 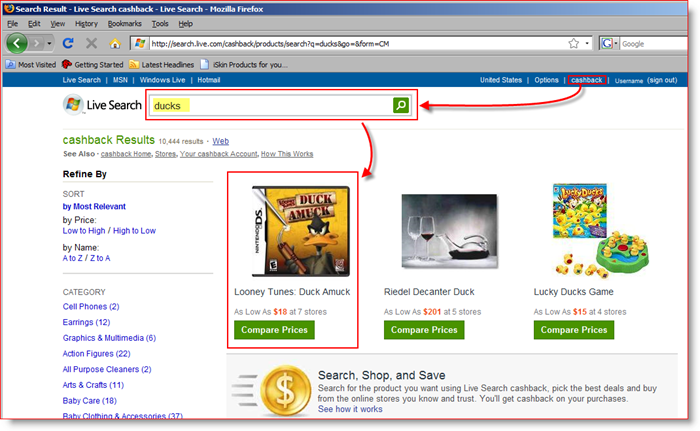 Click the Cashback tab then go ahead and Use Live Search to find the product you want. Click the Product to view its comparative pricing and Cashback percentages. On the Compare Page, you can see all the different participating stores that are selling your coveted item, AS WELL as the Cashback percentage each merchant offers. Live.com even calculates what your price will be after you get your Cashback! Very Groovy! 6. When you’ve decided, Click the Vendor then Click Go To Store. From there you should be golden. Live.com will track your purchases, and a confirmation email will follow after you complete the purchase along with all the “Cashback” details. Have you ever used Live.com Cashback or perhaps FatWallet? I would love to hear from you as well as any great deals! I’ve used this to buy 3 or 4 things by now. I haven’t got any INSTANT cashback like they are advertising on the live.com site, but only 30 more days until I get my big $$$ back. Nice. Glad to hear we have a reader who has already tried this out. Was it very complex? Thoughts? Did you have to compromise on what you wanted? 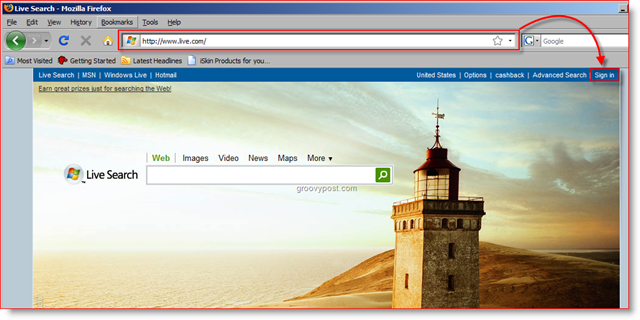 I have been using this since it was jellyfish.com (microsoft bought jellyfish.com) and it has worked fine for me both before and after the transition to microsoft. I have earned LOTS of cashback on purchases, much better than ebates. I did get instant cashback 1 time (it was an ebay purchase) but the rest I’ve had to wait the 60 days. Not a big deal — ebates pays you quarterly anyway, so waiting 60 days is actually less! I love ms live cashback and hope that they get more stores soon. @Katie – Great info! Had no idea the program was a spin-off from an acquisition. Thanks for the background and testimonials about it’s use. I’m waiting for my first Cashback on a purchase myself. Should be just a few more weeks. Just got $100 in cashback from a ebay purchase I did during blackfriday! went straight into my paypal. @Animis – Awesome! Thanks for the feedback!